The presence of subtidal rocks off the northern Italian Adriatic coast has been known since XVIII century, as recorded in the writings of Abbot Giuseppe Olivi (1792). Local fisherman have always called them "Tegnùe" for their ability to hold and tear fishing nets. Although fishermen fear the damages the rocks can cause, they highly regard this seabed for its abundance of fish. Tegnùe may be found in all the northern Adriatic, at depths ranging from 15 to 40 metres. Their size varies from small isolated blocks to structures hundreds of metres wide. Teguùe are biogenic carbonate rocks, built by marine organisms, usually over hard substrates previously formed by consolidated sand. Tegnùe are natural reefs which have developed over the past 3-4,000 years. They differ from tropical reefs because the main builder organisms are not corals but red calcareous algae, called "Corallines". 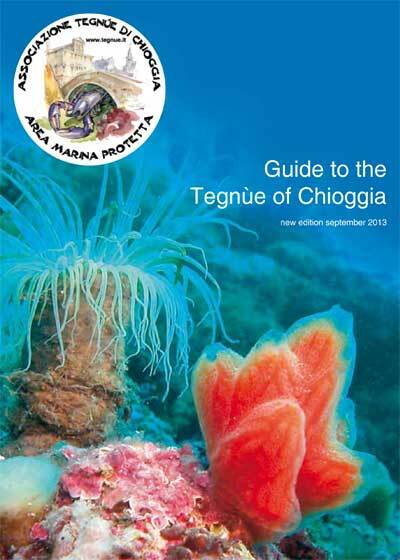 The Tegnùe of Chioggia no-profit Association was created from a common passion for the sea and from the need to study, enhance and protect the extraordinary and still little known environment of the Tegnùe, particularly widespread off Chioggia. Thanks to the project by the Paduan scuba-diver Piero Mescalchin, which included scientific material, photographs and films, on 14th September a protected area for the Tegnùe was established by the town council of Chioggia and a request was submitted to the Government. On 5th August 2002, the Area of the Tegnùe of Chioggia was declared to be a “No-Take Zone” by the Decree of the Ministry of Agricultural and Forestry Policies, and any kind of fishing activity was prohibited. Establishing an area where fishing is prohibited, however, was not sufficient for ensuring correct protection and management of this natural heritage. This concern needed to be actively addressed by involving the town of Chioggia and its people. On 4th December 2002, therefore, the “Tegnùe of Chioggia” Association was founded. The Association's technical committee includes representatives from various fields: research, fishing associations, tourist operators and diving centres. The presentation of a three-year project, focusing on knowledge, valorisation and management of the No-Take Zone, was the first step taken by the Association. The project was presented to Regione Veneto with the assistance of all Executive committee and Technical-Scientific committee members. Economic support was immediately granted thanks to the thorough knowledge and high professional skills shown. The project started in July 2003. Its aim was to perform wide-spreading educational activities, as well as to provide moorings and diving routes, and test possible eco-compatible and sustainable tourism in the area. Scientific activities, including sea bottom characterisation and population status monitoring for the evaluation of management intervention efficacy, were developed by research Institutes. The latter acted independently within an agreement of cooperation. Where possible, the Association provides support and offers training opportunities to young graduates through Region-funded scholarships. 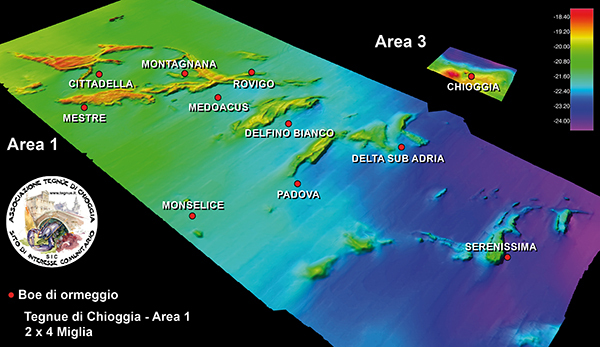 The Central Institute for Scientific and Technological Research applied to the Sea (ISPRA) carried out geomorphological surveys, with its oceanographic ship and Side Scan Sonar techniques, over the entire area. It created a highly important map showing rocky outcrops and traces of trawl fishing. It is currently dealing with the local information system and with fishing- related concerns. The Environmental Research Centre of the University of Bologna has studied sites using 3D reconstruction of sea bottoms and non destructive photography sampling in order to assess large-scale distribution of epibenthic fauna. Instead, the Hydrobiological Station of the University of Padua is performing a qualitative and quantitative analysis of fish fauna. The Institute of Geosciences and Georesources (IGG) of the National Research Council of Padua carried out petrographic, mineralogical and chemical tests on biogenic rock samples taken from the Tegnùe of Chioggia. The Institute for the Sciences of the Sea (ISMAR) of the National Council of Research of Venice introduces scientific information gathered from the area of Chioggia within a wider northern-Adriatic context. The Association is also deeply committed to education and environmental diffusion. As well as creating information material and the www.tegnue.it web site, it has developed a complete educational project for primary schools with the assistance of experts from the University of Padua. In the kit distributed by Regione Veneto, all class four pupils received: a DVD video introducing the "Sea World of the Tegnùe", a fairy tale and a games book. Regarding tourism, 11 luminous buoys were launched within the no-take zone. The buoys not only signal the reserve but are also the first step towards environmentally compatible tourism. Mooring to the buoys, instead of anchoring, avoids damaging the delicate carbonate rocks and the organisms growing on them. The maps and guided routes prepared by various centres lead divers to the most interesting points and increase diving safety. In compliance with the institutional decree, the Port Authorities of Chioggia and Venice issued an order forbidding within the No-Take Zone any form of professional or sports fishing, the collection of seabed organisms, anchoring and scuba diving outside the buoys. These measures aim at preserving commercial species and the surrounding environment. The creation of a repopulation and reproduction area, with time, may increase fish population in the surrounding areas and guarantee fishing profitability. Greater knowledge on these places, however, could lead to an increase in anthropic pressure, caused by divers and fish poachers, and consequently to environmental over-exploitation and degradation. For this reason, access regulations are necessary which, in collaboration with law enforcement agencies and local authorities, verify indiscriminate anchoring, number of divers and buoys for each mooring, poaching and waste disposal. Awareness-raising activities promoted by the Association towards tourists, fishermen and local authorities also contribute to fighting the above actions. Per l'accesso ai punti di immersione consulta la normativa, il regolamento. The low depths, the influx of fresh water from the rivers and summer sun radiation lead to water column stratification and a constant, strong and sometimes very evident thermocline. Seabed water temperature is rather cold even during summer so a 5 mm wetsuit is recommended. Temperatures may drop even to 10°C below zero during winter. Water transparency depends on many factors and varies from one area to another throughout the day. Water turbidity is caused mainly by weather conditions, especially southeasterly seas which make muddy seabed sediments rise in the shallow waters. The best season for the abundance of fauna and flora and for water transparency is the winter and spring period. After descending down the mooring line and reaching the sea bottom divers will find the cement block. The line(s) leading directly to the routes start(s) from here. Different types of lines have been used to easily distinguish them from the rest and identify the return route. Each route is marked with arrows indicating direction and distance to the return route. Attention!! Route integrity is not guaranteed owing to possible damages caused by anchors.